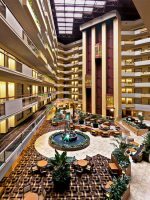 This 124-room airport hotel, part of the Drury Hotels group, offers amenities guests love including free hot breakfast, free evening beverages and a complimentary airport shuttle. The hotel is located just 15 minutes from downtown, six miles from the famous San Antonio Riverwalk and The Alamo. There is Free Wi-Fi, free soda and popcorn (from 3-10 pm) and free parking. There is an outdoor pool, 24-hour fitness center, guest pantry, laundry and same day dry cleaning available. Guests feature either one king bed or two queen-sized beds. The complimentary breakfasts include fresh fruit, biscuits and gravy, make-your-own Belgian waffles, cereal and more. Nachos and pretzels are served in the evening with beer, wine and soda. There are special packages including tickets to SeaWorld San Antonio, 18 miles away, and Six Flags Fiesta Texas, 12 miles from the hotel.. Military families and veterans are afforded special rates as well. Check in at 3 pm; check out at 11 am. dragged ourselves in around midnight. He was so friendly and helpful; he went out of his way to get silverware, napkins, and plates for us. Also we called for shuttle from baggage claim. Michael was so helpful telling us exactly where to go in airport and the shuttle was there to pick us up within 10-min of calling them. Not going back there ever. Hotel had homeless people hanging around the back of the hotel. There was no parking so we had to park far from the actual hotel. The rooms are dark and smell like old moldy sheets. The beds are uncomfortable. The hotel I think was old and unkept. The carpet in the hotel has stains and bleach spots everywhere down the hall. Just not at all what I expected. We had reserved 3 nights and ended up just cancelling our reservation after the first night because it was not a good experience.